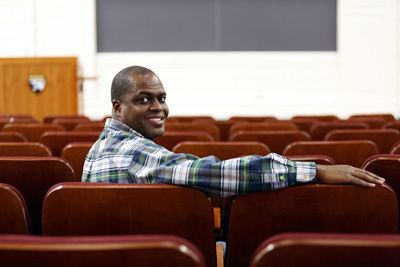 Brian Mitchell’s path to a career in higher education was not a traditional one. The bulk of his professional life was spent in marketing in the private sector, before being recruited by the Goizueta Business School at Emory University to be its associate dean for full-time MBA programs. Mitchell enrolled in the Higher Education Program (HEP) in order to get a greater understanding of his role in higher education and the ways in which higher ed leadership can differ from what he had been used to in the private sector. He was happy to find that there was even more to learn at the Ed School. Mitchell will be returning to Atlanta after graduation to continue in his role at Goizueta, and help the school extend its focus to include key local and global partnerships in a new way. Upon learning that he had been honored with the Intellectual Contribution/Faculty Tribute Award for HEP, Mitchell answered some questions about his time at the Ed School and beyond. What was your greatest fear before attending HGSE? I feared that I would not fit in with my classmates because of the age difference. Happily I was wrong about that! The HEP cohort has been wonderful, and I have relationships with some of my classmates that will last the rest of my life. What is something that you learned at HGSE that you will take with you throughout your career in education? The importance of community colleges in the American higher education system. Approximately half of American college students are enrolled in our community colleges. Resources, programming, and the national conversation need to reflect that. Is there any professor that significantly shaped your experience at the Ed School? All of my professors were great. Bridget Terry Long is an absolute master of her craft. In her economics class, I was more like a fan than a student because she is a rock star! How did you stay inspired throughout the year? At least once a week I took the (slightly) longer route to or from HGSE and walked through Harvard Yard as a reminder of exactly where I am and the significance of this opportunity that we have. Despite your busy schedule, you always make time for … writing postcards and letters to my kids. What will you change in education and why? Institutions that specialize in teaching business to students will have a stronger focus on global and public challenges, and teach business with the objective of impacting those issues. I believe that our students are getting to this point more quickly than our institutions. We need to catch up. What advice do you have for next year’s students going through your program? Show up for everything you possibly can in August and September. Don’t wait. You will be glad that you immersed yourself early when you realize how quickly the year passes. Read about the other recipients of this year's Intellectual Contribution/Faculty Tribute Award.